Lamp - Where can l have this lamp? What material is used for the hearth? Love the chair! Where can I buy it please? TY! fireplace glass mosiac - what size are the glass mosiac's that surround the fireplace? Tile around fireplace/raised hearth - Love the fireplace! What is the size of tile and color. The raised hearth, is that a quartz? if not, what material is it and what color? Thank you for your reply. the tile is a glass mosaic from Ann Sacks with white grout. My apologies for not having the specific link. The hearth is quartz and is Caesarstone 4030H (honed). Can you tell me what color green this is? - For my master bath. Love the chocolate that anchors the lively green! What green did you use? Can you tell me where the coffee table is from? I've been looking for something just like that! Love the Coffee table - Tell me more about the coffee table please. It was purchased from Crate & Barrel, but is no longer available. The table - Where can I find the coffee table? Great fireplace! glass fireplace front/glass mosiac tile - do you have full glass fireplace doors in this fireplace? How do they open? And, is the mosiac glass time surrounding the fireplace white? Or another color with white grout? The overhead light is perfect, simple and elegant! Where is it from? Is the fireplace surround wood and if so, is special paint required? - If the surround is made of wood, does it need special painting? the fireplace surround is wood and didn't need any special paint. The area around the actual fireplace though is tile and you should follow manufacturer recommendations on the clearances required to combustible materials. Hardwoods - What type of hardwoods and what color stain? You are so resourceful! Lego strong!!!!! the hardwoods are Brazilian Cherry with a custom dark brown stain. Thanks for the comments! Love the fireplace - Love the fireplace, who is the manufacturer? Thanks! Think about this room without the bold wall color. Wow. 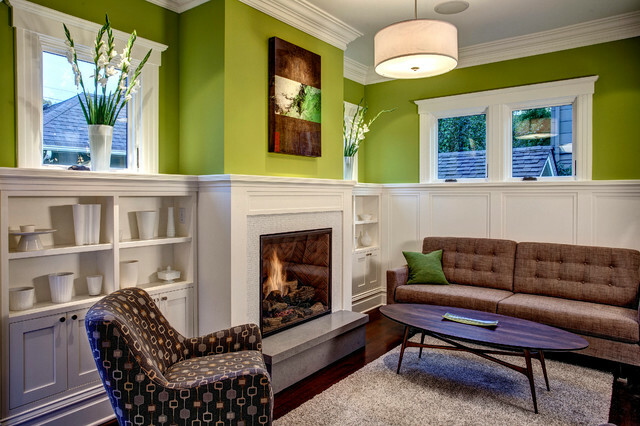 Can you picture it being blander and more conventional?Paint is one thing that can make or break a room. I seriously love paint! It is relatively inexpensive, the color options are almost infinite, and it is not overwhelming to change if you tire of it or it doesn’t work.